Eighteen-month Postdoctoral Scholar awards are offered annually to recipients of new or recent doctorates in the fields of chemistry, engineering, geology, geophysics, mathematics, meteorology, physics, and biology as well as oceanography. The competitive awards are designed to further the education and training of the applicant with primary emphasis placed on the individual's research promise.In order to be eligible for one of these awards, applicants must have received their doctoral degree within the past 2-3 years. As a condition of the award, successful applicants must be able to present their diploma, a certified copy of their diploma, or a certified letter from the appropriate college or university official stating that they have completed all of the requirements for their degree including the completion of their final thesis, before they begin their scholar appointment. However, applicants do not need to have already received their degree prior to applying. It is also expected that candidates will have a command of the English language. MIT/WHOI Joint Program Students, and those holding any type of WHOI appointment at the post-Ph.D. level during the 12 months prior to December 31st of the Scholar application year are not eligible for the Scholar competition. Successful applicants of awards can initiate their study and research period at the Institution any time after January 1 and before December 1st of the year following the award notification. December 1st is a firm deadline. Recipients of the 2019-2020 awards will receive a stipend of $60,000 per year for an 18 month appointment, plus a relocation allowance. Limited support is also available for travel expenses, equipment, supplies and special services. Extensions of scholar appointments may be possible if required to complete the initial research program. Extensions are rare, and restricted to one, six-month extension of the initial 18-month Scholar appointment, and the extension must be contiguous to the original appointment. Requests to extend a Scholar appointment will not be considered until after the first annual review. An extension request is initiated by a Scholar and his/her sponsor(s) and requires approval by the Chair of the Department hosting the Scholar and the Vice President for Academic Programs. In addition, a source of WHOI internal funds (unrestricted funds) to support the costs of the extension needs to be identified by the Scholar's advisor or others involved with the Scholar's research program. Extensions of a Scholar appointment beyond 24 months are not allowed, although a Scholar can be considered for appointment as a Postdoctoral Investigator following procedures defined by WHOI Human Resources. Scholars are chosen through a highly competitive process, and for this and other reasons, these appointments carry special recognition at the Institution. Each recipient is encouraged to pursue his or her own research interests in association with a member of the Resident Scientific or Senior Technical Staff. Each award recipient is provided with office and laboratory space in close proximity to the resident staff acting as sponsor and general advisor throughout the award period. Communication with potential WHOI advisors prior to submitting an application is encouraged. We will make sure that any staff member you mention as a potential sponsor has an opportunity to review your application. The best way to obtain more information about ongoing research here is via the individual Department, Center and Institute web pages found on the Research Areas page. 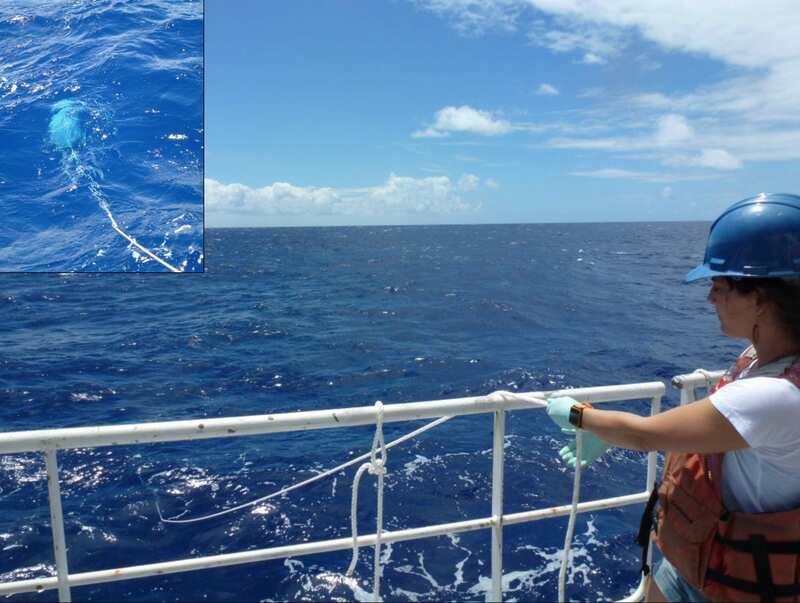 Postdoctoral scholar Monica Rouco-Molina deploys a plankton net for surface sampling of Trichodesmium at station ALOHA in Hawaii.